Brevini Fluid Power (BFP) has announced the release of a new SH11C series of fixed displacement axial piston pumps and motors. Suitable for a wide range of industrial applications the new series offers improved flexibility, high performance and reliability. At the same time BFP has also released the new SH7V series of axial piston hydraulic motors for use in heavy duty transmissions. The series can be used in both open and closed circuit systems and features a 40° bent axis piston design. The availability of 8 different displacements from 55 cc to 180cc and the ability to operate continuously at 430bar with a maximum pressure rating of 480bar gives the motors the flexibility required to suit many different applications. The performance is further enhanced by the use of heavy duty bearings, which permits high radial and axial loads. The SH7V series of variable displacement axial piston motors are designed to give similar performance and reliability characteristics to the SH11C for applications requiring a variable displacement hydraulic motor. The range offers improved performance when compared to similar products on the market with high power density and improved efficiency at low speeds. Designed with a minimum to maximum displacement ratio of 1:5, optimum performance delivers between 32cc and 160cc. 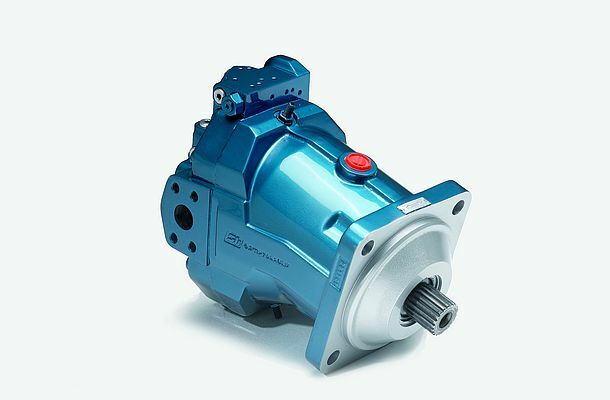 There is also an optional feature which allows the motor to operate at zero displacement.